Most of the listeners who responded to my debate with CBC manager Andrew Cochran about the network’s (in my view) inflated coverage of weather are just fine with the CBC’s weather treatment. 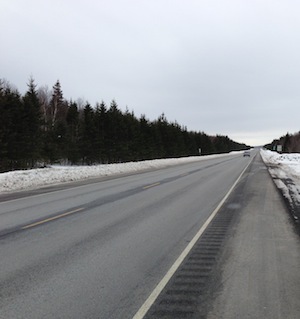 Highway conditions at 3:30 pm, February 20, when Cape Breton schools closed early due to forecasts of possible freezing rain that evening: Pavement dry; precipitation nil. This doesn’t surprise me. Some people like being frightened about weather, just as others like being frightened about crime. Lurid coverage of crime by some media has led to a sharp increase in the public perception of personal risk from crime even as crime rates have plummeted. I see a parallel with public perception of weather risk. Two listeners added interesting points to the debate. Rosemary Algar of Cape North, a listener who shares my annoyance at weather hyperbole, pointed out a subtle result of our current timorous approach. We are teaching our children, she said, that at the first sign of inconvenience, it’s OK to stay home and disregard our responsibilities to work and school. Worse still, it’s school officials who are delivering that message.